Do you experience stress, getting less sleep than you need, feeling you'd like a clearer sense of purpose? These are common experiences in modern city life. Meditation offers a practical way of improving the quality of everyday life through working directly with one's mind. Through the practice of simple techniques, meditation helps to develop self-awareness and happiness. Benefits can include relaxation, clarity of mind, improved sleep, improved relationships, creativity and effectiveness. Modern neuroscientific evidence demonstrates that meditation practice cultivates positive mood, clarity and relaxation. It is a path of tranquillity and insight tried and tested in human experience for over 2500 years and is still as relevant and effective as ever. 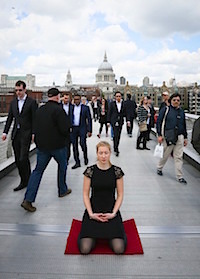 The London Meditation Project exists to make the benefits of meditation more widely available to people who live or work in London. Our team have years of experience in meditation practice and teaching. We aim to convey the practice of meditation in a direct, lively and accessible way. We offer a range of opportunities to learn and practice meditation, from warmly welcoming individuals to early morning and lunchtime classes and day retreats to visiting organisations for meditation in the workplace. We are also offering meditation for veterans and service-people and their loved ones whose lives are also affected by the military experience. Through the practice of simple techniques, meditation helps to develop awareness, happiness and confidence. We teach Mindfulness of Breathing, Metta Bhavana (loving kindness) and Walking meditation. These simple but profound meditation practices are open to all to learn and benefit from and we welcome people from any faith background or none. The practices themselves are rooted in the Buddhist tradition. See our calendar for dates for your diary. Please contact us to ask any questions about what we do and to explore whether it might be helpful for you or for your workplace. We aim to make meditation widely available and so our fees are on a sliding scale, negotiable according to the circumstances of the individual, group or organisation.